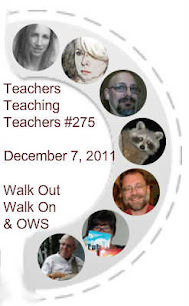 We begin a conversation about Margaret Wheatley’s and Deborah Frieze’s book, Walk Out Walk On [ http://walkoutwalkon.net  ], and we explore how the Occupy movements and Educamps might reflect some of the principles in this book. We have been working on a quiet revolution the last four years in Colorado [ http://labconnections.blogspot.com  ], both outside and in the public school system, in order to create the communities the authors, Margaret Wheatley and Deborah Frieze share and describe so poignantly, so beautifully in their book. Mary Ann Reilly joins us this week. Mary is also be inspired by Walk Out Walk On, and has been trying to get a group of teachers together to talk about the book. Mary is a progressive educator, artist, photographer, and writer of Deepening Literacy Learning: Art and Literature Engagements in K-8 Classrooms. [ http://infoagepub.com/index.php?id=9&p=p4b917a12e9f4a  ] We are delighted when she is able to join our conversations at Teachers Teaching Teachers. I wanted to spark some interest and also to make this unit relevant for my students. To get started, I showed the students these two videos: “UC Davis Protestors Pepper Sprayed” [ http://youtu.be/6AdDLhPwpp4  ] and “UC Davis Chancellor Katehi walks to car amidst protesters” [ http://youtu.be/nmfIuKelOt4  ] These videos sparked some interesting discussion about non-violence and the violent reaction. Some students were shocked by the violence of the direct pepper spraying on the docile students, and the lack of reaction on the students’ part. Why did they just do nothing? Why didn’t they fight back? They also remarked about the silence on the second video. We talked about the impact of that silence and the effect of the sounds of the heels hitting the pavement. Again, someone questioned why they didn’t get up and get in the Chancellor’s face. 20:59:18 Scott Shelhart (@kd9sr): can you see the livestream? 20:59:23 Kelsey: The video is very quiet. I'm having a hard time hearing it. 21:01:38 Peggy George: how cool is that!!! Welcome Kelsey! 21:03:07 Scott Shelhart (@kd9sr): Peggy, is the stream audio ok? 21:09:39 Peggy George: this technology is amazing!! Love it!! 21:11:09 Peggy George: I wish I could copy and paste in this chat, but I can't. :-( It would be great to captures some of these quotes and share some of our own. 21:15:54 Scott Shelhart (@kd9sr): Kelsey, these are the co-authors of a book. 21:16:30 Kelsey: That video is amazing, but what is the significance of the pictures they were taking? 21:17:19 Peggy George: thanks for always doing such great blog posts about the webcast, Paul!! Really helpful to have the link! 21:21:12 Kelsey: What audience were they trying to reach with this book? Students? Teachers? 21:23:32 Scott Shelhart (@kd9sr): (monik's response from the other chat"
21:24:39 Peggy George: that's a great question from Liam! 21:24:49 Kelsey: I visited the Occupy St. Louis camp when I was there. it was amazing. 21:24:55 Scott Shelhart (@kd9sr): Much of the content is not suitable for all. teachers must become the filter. 21:25:14 Scott Shelhart (@kd9sr): Being a filter is a HUGE respnsibility. 21:25:43 Peggy George: @Kelsey--did you find yourself wanting to be part of Occupy St. Louis or were you just interested in seeing it first-hand? 21:27:15 Kelsey: I think it would have been a great experience to take part in history in the making like this, but we just happened upon the camp when we were walking around the city park. 21:27:41 Peggy George: is anything happening in terms of actions for next steps or is it just talk? 21:27:47 Scott Shelhart (@kd9sr): Did you speak with anyone, or did you just observe? 21:29:25 Peggy George: @Kelsey was your first-hand impression the same as what you were hearing reported on TV? 21:31:12 Kelsey: not at all. Its being portrayed as violent, dirty, and disorganized, but i really felt that these people were organized and passionite about their cause. it made me wish that i lived in a bigger city where protests took place. 21:31:49 Peggy George: very interesting @Kelsey! Valuable observation! 21:33:58 Kelsey: She makes a very good point. 21:35:01 Peggy George: a lot of our politicians are "local"--does that make them good leaders? 21:37:10 Peggy George: @Liam--does that approach lead to lots of leaders with no followers? 21:39:37 Peggy George: true but in that context how do you manage action and movement towards common goals when it's hard to figure out what the common goals are? 21:39:46 Kelsey: When you think about it, everyone is "local" to somewhere. Every world-changer had to satrt off somewhere. MLK started in Atlanta, Ghandi in Porbandar. 21:40:29 Scott Shelhart (@kd9sr): Kels, Peggy and I took a vote. You should be blogging. 21:40:50 Peggy George: absolutely!!! You would be an amazing blogger Kelsey! 21:41:13 Kelsey: I would rather find an online debate team. I am a very opinated person. 21:41:30 Scott Shelhart (@kd9sr): Write a good blog and the debate will come to you. 21:42:07 Kelsey: If you help me set one up, I'll start writing. 21:42:42 Scott Shelhart (@kd9sr): You have a Google account. We can set up a Blogger blog in 2 minutes. 21:42:49 Peggy George: Youth Voices is a great place to start blogging too! 21:43:30 Kelsey: i'll let you know when I get started : -) And dosn't liam run Youth Voices? 21:44:13 Peggy George: I'll be waiting to see your first blog post!! 21:44:55 Peggy George: will those things that get organized be sustained or will they fade away in a few months (similar to many social media groups)?? 21:45:31 Kelsey: I'm excited to write it! 21:48:18 Scott Shelhart (@kd9sr): Kels, be sure to tell your social studies teacher about this event. We can send him a link to the recording when it is posted. 21:48:39 Kelsey: He'll like it. 21:49:44 Kelsey: There has to be a better system of streaming it. the people are inturrupting each other and the videos are switching around. 21:50:04 Scott Shelhart (@kd9sr): Come downstairs and watch my screen. 21:50:43 Kelsey: Can i say hi to everyone on the camera while i'm down there? 21:50:51 Scott Shelhart (@kd9sr): yes. 21:52:32 Kelsey: i'm one my way down now. 21:53:06 Peggy George: or is it the teachers who are helping to see and understand the message?? 21:54:11 Peggy George: Angela Maier's campaign "YOU MATTER"
21:54:33 Peggy George: she's an incredible contributor in our chat tonight!! 21:54:51 Peggy George: hard to believe she is only 13 years old! 21:56:26 Peggy George: I"m sure she is!!! 21:56:52 Peggy George: what do you do when it's time to vote and you don't like/support any of the candidates? 21:58:30 Peggy George: love that story! 22:00:45 Peggy George: how do you talk about that with students? 22:06:33 Peggy George: that has been an incredible "book talk" among other things and sure makes me want to read the book! 22:07:15 Peggy George: LOve it!! 22:07:45 Peggy George: I can't wait to read it!! 22:09:58 Peggy George: thanks everyone!